Hello, hello! Guess what?! IT’S COMING!!!! My favorite season!!! FALL!!!!!!!!! (Sheesh—-exclamation mark happy much?!) I still have my spring wreaths on the door, which has been driving me berserk, and I have been craving some cute fall wreaths. 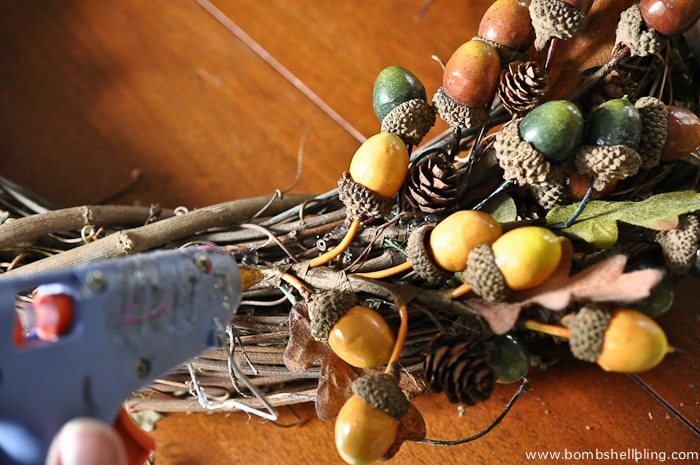 Today’s fall wreath blog hop has given me the perfect motivation to finally pull the trigger and MAKE some! My son and I are both completely smitten with the way that this fall hedgehog wreath turned out. 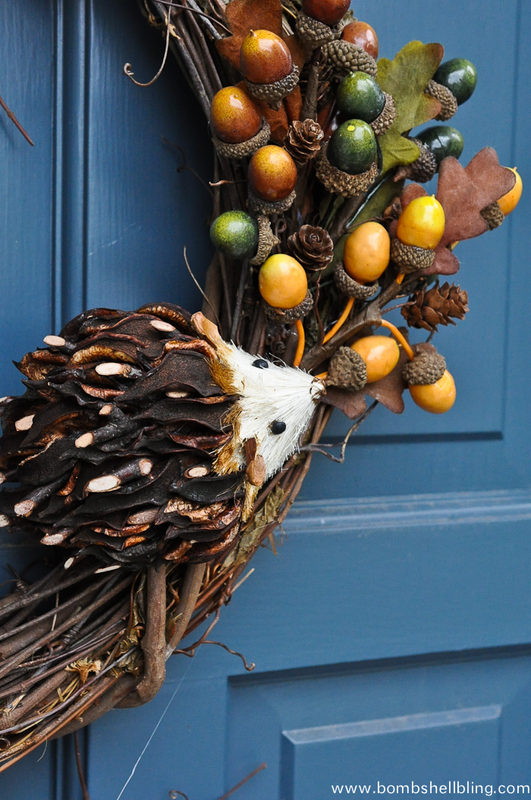 But before we talk hedgehogs, take a look at the fall wreaths that my blogging buddies have cooked up. Seriously…….amazing. I am surrounded by freaky-talented people. Wow. Be sure to click on each link below to get all the tips from each blogger! Amazing, huh? Be sure to visit their sites for full pictures that will be great for pinning! Now on to the tale of me sweet little hedgehog. Last week I went to JoAnn Fabrics to browse around and get inspired, and I spotted this sweet little hedgehog. I was thinking aloud that maybe I could use him and my five year old son grabbed him and started cuddling him and saying, “Use him, mama! !” in the baby voice that he usually reserves for his cousins that are actual babies. Okayyyyyyy……. I guess it was hedgehog love at first sight! 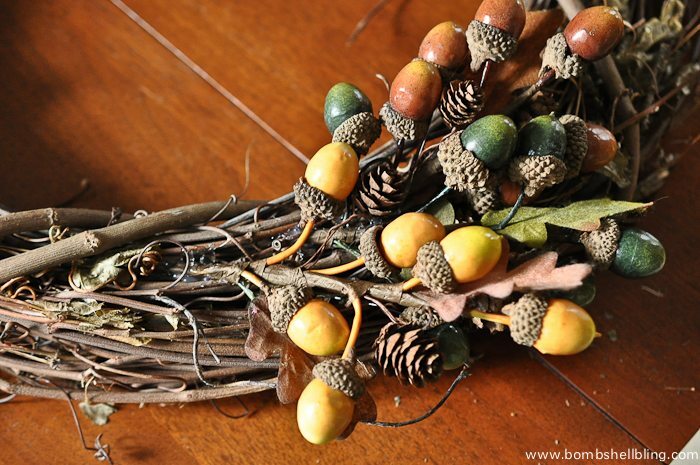 I spotted the branches of acorns in a box near the hedgehogs (this is all in the fake flower section, by the way) and decided to grab an 18″ grapevine wreath form and make the simplest fall wreath EVER. For real. Alrighty, then, let’s keep moving. 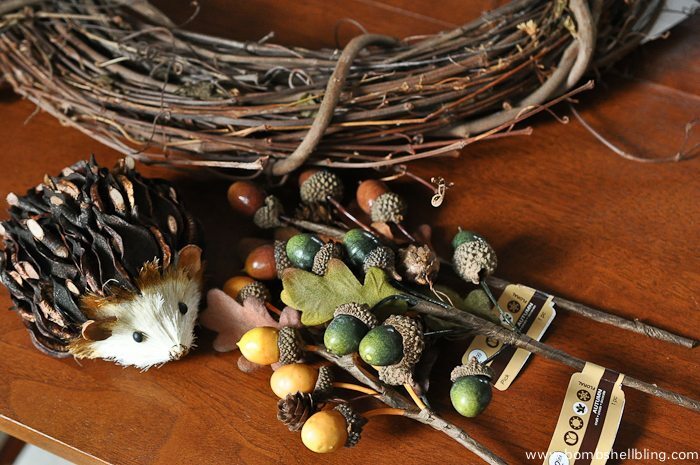 To make this wreath you will need an 18″ grapevine wreath form, three branches of fake acorns, a wooden hedgehog, and a hot glue gun. I found all of this at JoAnn Fabrics. Next I slathered the back of the hedgehog with hot glue and stuck him directly onto the wreath form at an angle that I liked. That’s it. Seriously. INSANELY easy. I told you!! I am totally loving having this wreath on my front door. I am ready for fall, my friends. Bring it on! 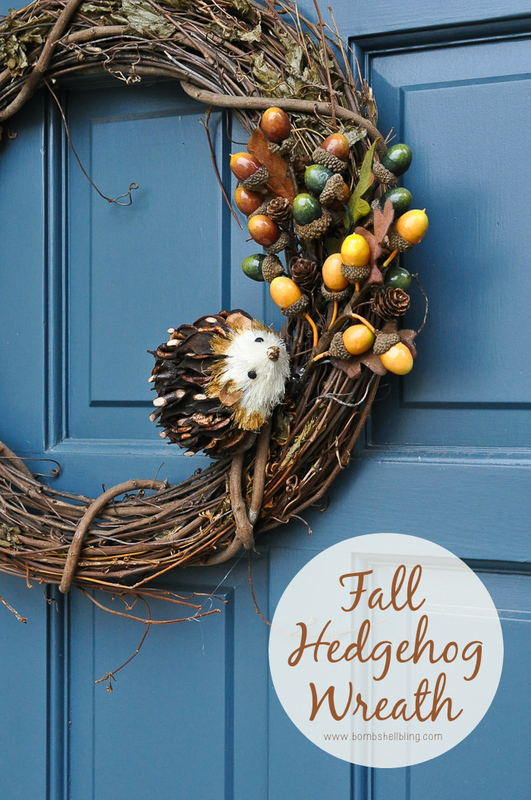 I am not a fan of fall (summer is my season) but I LOVE the hedgehog wreath! Aw-what a cute little guy! I will have to check my Joann’s to see if they have any! I just had to come check out the cute hedgehog! Great job for putting it together “under duress”! Visiting from Makers Party. This is the cutest thing I have seen in so long!! I looove it!! Just adorable <3 Thank you for linking it up to the Inspiration Galore Project Party last week. You are one of my features tomorrow over at http://www.recreateddesigns.com. Pinned and shared. Have a great weekend! OH my gosh — I LOVE this. The hedgehog IS adorable and I love how simple and quick this is but with big impact! Super cute idea. Thanks for sharing at the #InspirationSpotlight party. Pinned & sharing. Love the hedgehog – so CUTE!. 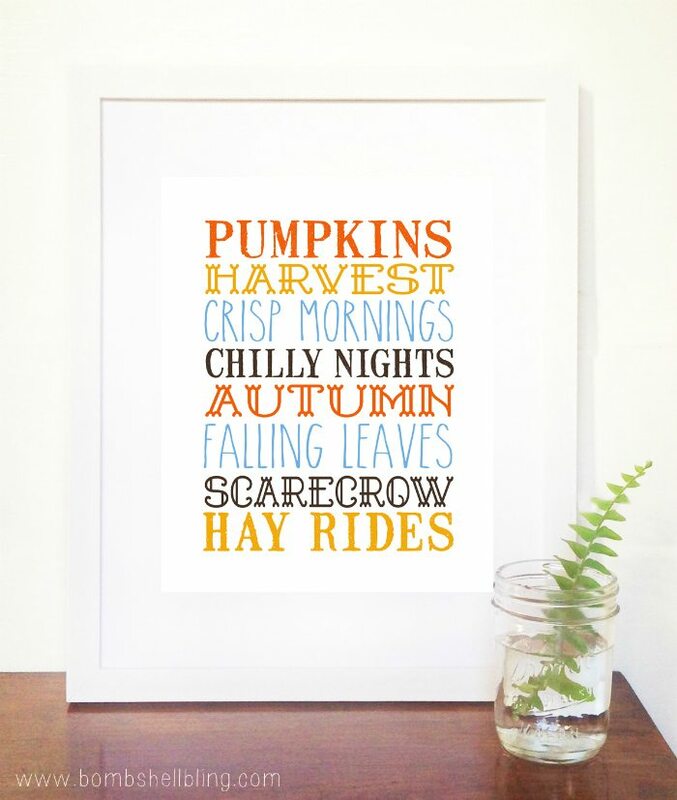 Featuring this at Family Fun Friday rounding up 10 Easy DIY Home Decor Ideas: https://www.happyandblessedhome.com/diy-home-decor-ideas-family-fun-friday/ Thanks for sharing with us! We had a pet hedgehog when my oldest child was younger so this really appeals to me. I’m sharing it in a roundup post to publish on 10-14-17.